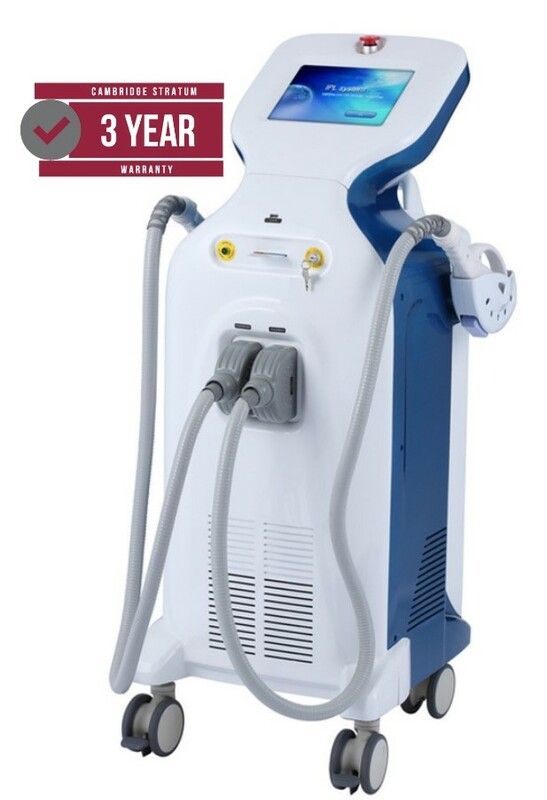 Both Intense Pulsed Light (IPL) and IPL plus Radio Frequency (RF) energy (EPL) are available from this versatile machine. The Intense Pulsed Light system works on the basis of selective thermolysis. Intense pulsed light as the name implies is a concentrated amount of light energy produced by a Xenon flash lamp. 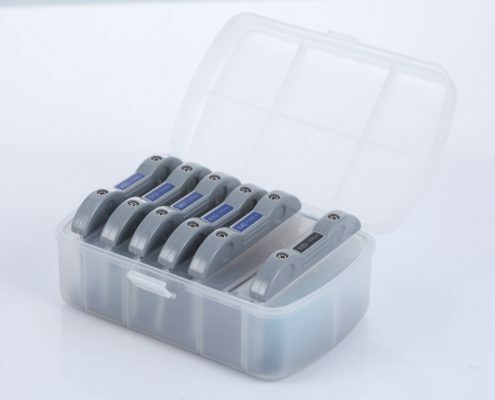 It has an initial broad spectrum of 400 to 1200 nm that can be filtered to optimise the spectrum of the intense pulsed light for the condition being treated. The addition of RF which has the same effect on all skin types reduces the amount of light energy needed, thereby reducing the risk of pigmentation changes post treatment in darker skin types. The addition of RF also enhances the removal of lighter hair but it would be wrong to claim that this technology is ideal for the removal of blonde, white or red hair. IPL and EPL are tried and tested treatments for clinics moving into the field of light based therapies that wish to be able to address a range of indications at a modest cost including, active acne treatment, vascular lesions, pigmented lesions, skin rejuvenation and hair removal. TEC cooling of heads and water tank ensure patient comfort and improve reliability. EPL utilises three different forms of energy to achieve the desired result! Initially the surface of the target area is cooled by the TEC modules in the treatment head. This greatly improves the comfort of the treatment and reduces the risk of damage to the skin. Please note – the temperatures are to illustrate the process and are not necessarily the exact temperatures experienced in practise. The cooling of the epidermis is maintained. In addition an intense pulse of light is fired into the skin, which raises the temperature of the tissue through which the beam passes. However, in this case the target chromophore is Melanin and the wavelengths of light used have been chosen to target Melanin in the hair shaft and surrounding cells. 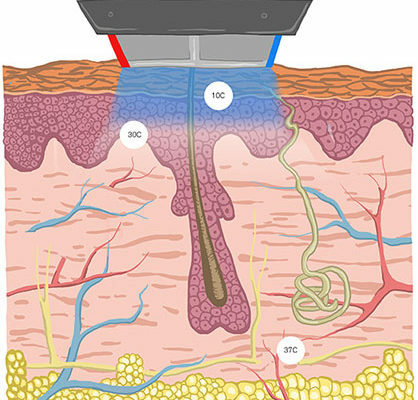 This causes the temperature of the hair shaft to rise above that of the surrounding tissue. 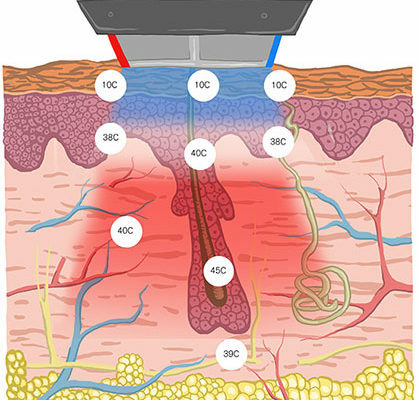 Increasing the temperature of the dermis and in particular in the area of the target also has the effect of reducing the resistance to RF energy. Now when the RF energy is applied it will tend to flow where the resistance is lowest. Specifically it will follow a short path through the cooled epidermis and then in an arc through the hotter target region and back to the other contact. This has the effect of concentrating the energy in the target ‘region’ because of the lowered resistance. Not the target chromophore as RF does not make this distinction. 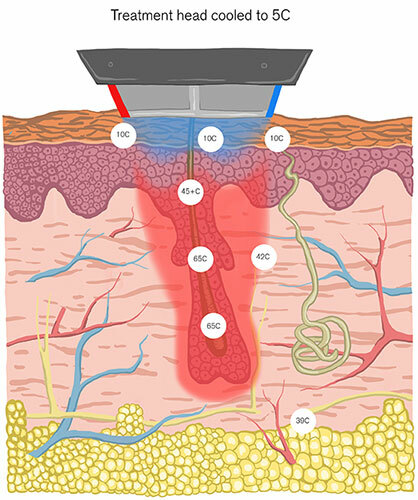 The ‘target region’ below the surface is heated to a therapeutic temperature leaving the epidermis and the areas surrounding the target at temperatures too low to have a permanent effect. This description is also true for treating vascular lesion with EPL and for treatments involving a diode laser and RF.